For this first Scotch remix we turn traditional Nordic themes insideout. Reinventing blanket and fairisle patterning, and redrawing shapes of mountain scapes for super-bold graphics. Scandi-winter prints are recoloured in pop brights and set against clean coastal shades. The place and person always in our thought bubble – a small Nordic village and its chief resident - a legendary poet living in the highest floor of the village lighthouse. This artist-in-residence inspires a super soulful line-up of men’s work wear styles. Hi-tech sportswear details like moutaineering zips and clips are the perfect finish for this old-meets-new Nordic clash. The next set of looks we gate-crash a secret club-house deep in the Scottish Highlands, where a decadent gang lives to learn and party hard. Tartans, tweeds and houndstooth-checks all look like rebellious cousins of the classics when infused with the colours and patterns of the future. Nights and days blend, so pyjama styling leads the way - with variations on bold striping in royal-club hues. 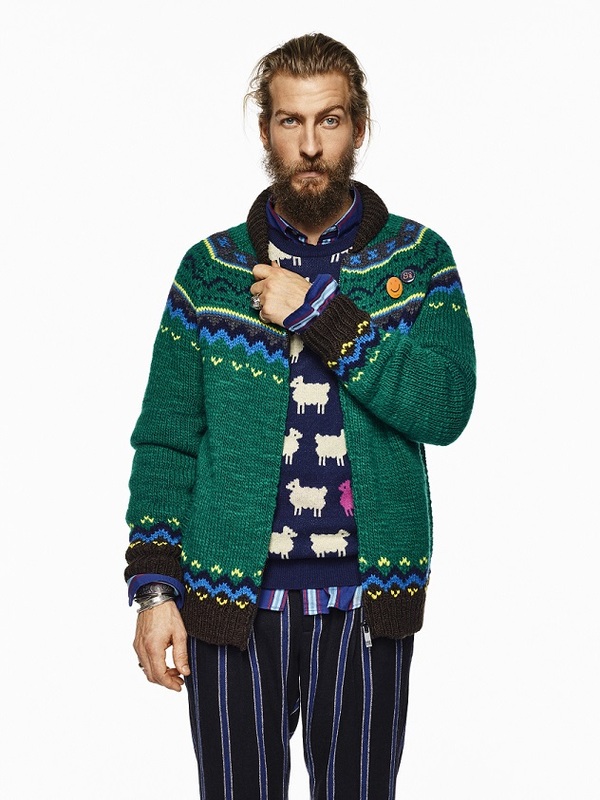 Our designers also re-think luxe Shetland and fairisle; infusing the wool with vivid pop-colours. Our club-set dresses the part in varsity jackets together with luxe sweatpants in wool and satinmixes. For underneath, tops which speak to decadent, spontaneous living. This is a non-uniform uniform working day through night. Saga Mountain, Western Tibet, 08:45 November 12th, 1950. For the third installment, we meet a nomadic biker couple who live to breathe in more of the world’s natural brilliance. 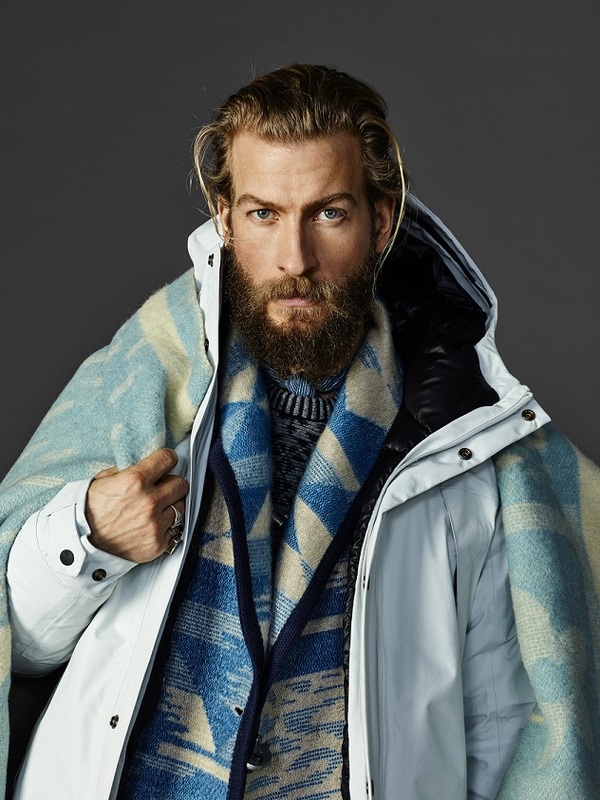 He seeks protection from the elements in the form of windblast-proof outerwear, wrap-up knits and quilting enforced detail. Bolts of cobalt blue and deep ranch red are our lead colours for legendary road trips. Knitwear comes in nomadic blanket patterns and detailing spans every look - pieces get fringing and check shirts longer, owing shapes. A designer favourite sweater in midnight is emblazoned with a blown up oriental-paisley. Detailed, yet easy to wear, the key Scotch ‘clash’ is seventies nomad meets rough, road rebel. For the last compilation of pieces, our lead wanderer believes ‘more is more’. Nothing is timid; everything rich and outspoken. From deepest colours to all-out oriental opulence in silk blends, high-shine and velour. There are silk bloom and bird applications on evening pieces and a signature oriental print in a dress shirt and glimpsing from inside a cocktail blazer. A deconstructed velvet suit makes dressing-up easy to do. Luxuriously deep tints are fused with vibrant pops discover these surprises in the winter-wool accessories, and hand-embroidered on a special sweater for day or night. Welcome to AW2016 and to some extraordinary characters. Everyone knows one; those that seem to inspire without trying, are admired without knowing, loved without demand. These types never stray from their chosen style of life, it defines them. They find themselves the talk of everywhere they discover, simply because of the magical inspiration they pose. Fall begins in Floen, in Norway, with a coastal cool girl who is unknowingly, the much-loved talk of this Nordic village. The colours of the North-Sea artic, royal, viking blue, and a library of off-whites inspire her look and the colour shades of our collection. Playful triangular chalet roof-tops throw a colour-burst of tangerine, and candy red in to our mix. Jackets and gilets inspired by blanket stripes are designer favourites. Nautical inspired details combine with super-soft knits to stay warm against the Nordic chill. As always, we clash key elements prepare for Nordic-coastal wilderness mixed with a clean, retro-sportwear edge. The next set of looks are inspired by an eccentric set living a decadent life in the highlands of Scotland, a short haul in to the future. A secret, literary club fuelled by endless art and music. Nights go long and blend in to days. Silky patterned pyjamas work as stylish fling-ons for both. This fantasy-fused life leads to new pop colours in cashmere knits, silks in brand new brights, ‘wear it all’ sweats with extra embellishment, and highcolour faux furs. The big royal clash: classics go to the future. Traditional hunting colours are remixed with new jewel brights. It’s never a quiet life, when the imagination flows free. The third AW2016 installment fall for a romantic rambling couple defined by the places and people they meet. Her look is a touch of rock and roll – a true, cool on-the-roader, collecting Tibetian embroideries, studs and leather trims. She layers her styles, combining an alpaca patchwork knit and jacquard lurex pant with our feature piece – a dusty parka with its own sheep gilet. For the world rambler, everywhere is home, for you can never discover too much wild, wandering fun. The final wander takes you down the Silk Route to China’s ancient forbidden city. The path takes in layers of oriental inspiration from kimono blooms to rich chinoiseries and luxe fringing. The muse never does things by halves, and is never afraid of colour when the rest go party-black. She dances in bright, printed sequin culottes and a kimono-print blouse. The ‘Silent Fighter’ pieces layer endless, timeless oriental inspiration, reinvented in fun Scotch & Soda silhouettes.